A communications plan is often neglected by preppers & survivalists. The BaoFeng UV-82L is an unbelievably low priced portable Ham radio with a lot of features and it also functions as a nice inexpensive scanner. Preppers will realize that this radio is basically a "steal" compared to much more expensive similar ham radios and they may want to stockpile several of these. Let's face it. In today's increasingly less stable world, Doomsday could just be around the corner. Having multi-band radio receivers so you can receive AM, FM, weather, public service (Police, Fire, EMS, etc. ), Ham, GMRS, FRS, and miscellaneous other broadcasts is clearly an essential tool that preppers will want to have for any potential Doomsday scenario. But before long, you will feel the need to transmit as well as simply receive information – whether it is to coordinate with other members of your group during the day, or for something urgent like needing assistance due to a medical or security emergency. For an inexpensive highly capable portable Ham radio, you cannot beat the Baofeng radios on cost. Beginners and even advanced Ham radio operators will appreciate the value of this radio. 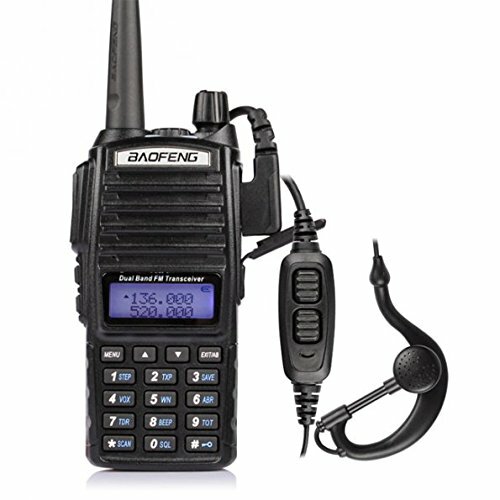 After extensively reviewing the different Baofeng models (and I own a UV-5R + model), I now recommend the Baofeng UV-82L Ham radio for preppers over any of the Baofeng models. In my opinion, the Baofeng UV-82L model is the best value radio for most prepper’s local radio communication needs. It's portable, so if you have to Bug Out, you can take it with you, or prior to a Doomsday scenario, just take with you wherever you go and use it as a scanner. Buy two or more to keep up with family or friends. This radio is dual band, meaning it can transmit on both VHF and UHF (with a range of 136-174 MHz and 400-520 MHz). This radio can also transmit PL, CTCSS, and DTMF tones. This allows it to access repeaters and private systems. There are hundreds of repeater stations throughout the United States, which increase the range of Ham radios to tens or even hundreds of miles. These repeaters often have battery backups and can function even in an emergency. Unlike cell phones, handheld radios do not need a nearby tower or repeater to work. As long as other radios are in range, a ham radio like the Baofeng UV-82L is a self-contained communication station. In other words, the UV-82L can be used in an emergency or long term survival scenario even if the cell phone network is damaged or overloaded with calls. This radio requires a license to legally transmit, and only on the amateur Ham radio frequencies. Watch the YouTube video below for more details. Note that the UV-82 and the UV-82L are the exact same model. Both are discontinued models, but they are still readily available and the value and quality is the best for what you get. Price compare both before buying. We have found the price of the UV-82L (which is actually from a reseller of the BaoFeng UV-82) is a few dollars less for the exact same model. Also, there is a new High Power model UV-82HP that is just not worth it in our opinion. We have not seen where it can pick up additional repeater stations plus they are not measuring the additional advertised watts (based on user feedback), so the "High Power" likely does not gain anything. It also costs twice as much. The UV-82HP does come with Baofeng Concierge Tech Support and a warranty, but the UV-82 & UV-82L are dirt cheap and your warranty is an additional radio for the same price of a UV-82HP, plus the Miklor.com UV82 Home Page and YouTube videos are your free tech support. But get the UV-82HP if you want the tech support and warranty. We just do not feel it is worth it but others may. 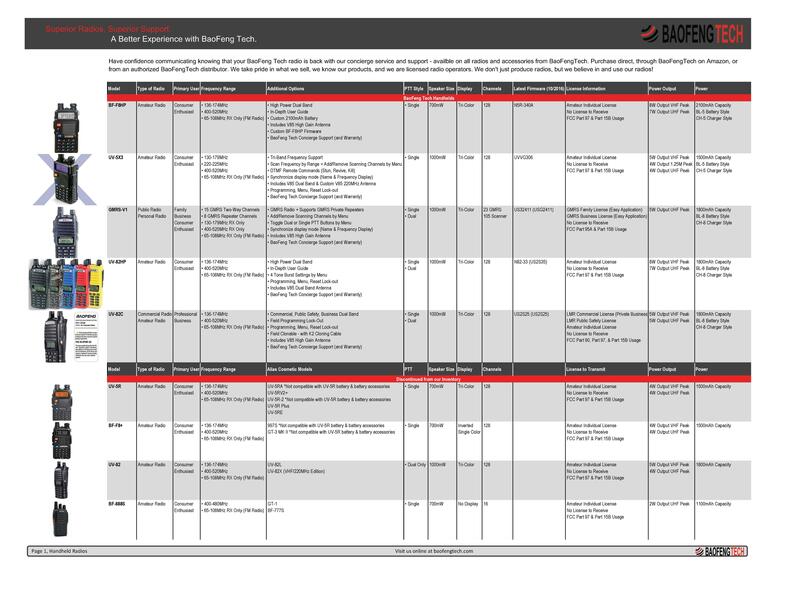 Here is a BaoFeng model comparison chart. The best bang for the buck is the UV-82L (or UV-82), but do your own comparison for cost and read user feedbacks. If you want to pay more for a non-discontinued model, look for models above the red line in the chart. Ideally, all preppers should at least get a Technician level Ham license and then you can legally use the Baofeng ham radio units on the Ham bands they support. HamTestOnline states that it takes 10 hours to study for the Technician (entry-level) class license exam. I think that is understated for the average person depending on their existing knowledge and fact that some people will overstudy to have a goal of making a 100 on the test instead of just passing the test. However, even if you take twice as long to study, then 20 hours of study to get a Ham license is not a lot of time to get this valuable license to enable a critical skill for communications. It is recommended to order the BaoFeng Programming cable (accessory below, and download and use the free Chirp software as explained in the Amazon listing User feedback and on the Miklor.com website). This should make programming your Ham radio much simpler. There are many YouTube videos that will show you how to program and use this radio or will show variations of the UV5R model radio. The following YouTube video provides a Baofeng UV-82L Ham radio review. The following YouTube video covers the basics of using a Baofeng UV-82L Ham radio. The following YouTube video introduces programming the Baofeng UV5R and UV-82L Ham radio models using Chirp software. "for a basic transciever you can't beat it. well beyond my expectations. its no motorola or kenwood, but it definitely get the job done for the price. Planning on purchasing 2-3 more." "Best starter radio on the market for a tight budget"
"I prefer it to my UV5R. It's my GoTo handheld." "This $40 Radio Looks and Works Like $300. I bought this UV-82L and the Baofeng UV-5R+. They both perform flawlessly. You can't go wrong for the money. They operate pretty much the same, but of the two, the UV-82L has the more hand-friendly and aesthetically pleasing form factor. In short, it looks and feels more like a tool than a toy. For $40, you're not getting a Yaesu or Kenwood with APRS and GPS expandability, you're just getting a programmable 128 channel UHF/VHF transceiver. But you're not paying $500 either. Delivery was prompt. Order the programming cable. Download CHIRP, as the programming app supplied is clumsy and the documentation is poorly translated. As always, remember you are breaking US law if you transmit on this radio without a valid Amateur Radio license." "Seems tough and versatile. You can program/tune in to fire; EMS; Police; Marine; marine forecast; FRS/GMRS; MURS; Federal; Mountain Rescue; Buss service, the list goes on. Of course the legalities are for you to research and bear. It is a comfort to take on outdoor activities just in case, and listen in on frequencies you not allowed to transmit on. I am not sure what other radios are out there and what features they may have but for the price I doubt you can go wrong. Unless you are a HAM (crazy enthusiast) then you may want to spend a few hundred, I can't see why though. I programmed this by hand following some instructions on youtube but it may be better to program it using the optional computer cord. I plan to use the cord to name my channels, eg. FRS1; Marine16 etc. It seems so much better than the ones I got issued as a rescuer or at the PD. It is small, light, seems durable and the battery also seems to last long." "Excellent two way radios. Easy to use and to carry around on the job. Very pleased customer." "O-KAY, so I have this radio. Out of all my Baofengs and Yaesu, this particular radio has the best sounding speaker as far as audio quality goes. And at 1 watt audio output power, it is also the loudest...."
"I purchased this because a friend of mine has a couple of them, and I wanted something more professional than a "walkie-talkie." These aren't toys... We used them this winter during a snow storm - we were out driving around in the snow looking for stranded folks (we were in different vehicles). They work well and the range is pretty impressive, though they can be easily blocked by certain topography. I have spoken straight line distances as far as 4.14 miles over hills and through trees in the Ozarks of Oklahoma. These transceivers pick up commercial frequencies such as police, fire, EMS, weather, etc. You can get yourself into some trouble if you aren't "licensed" to speak on these frequencies, so don't be an idiot and check your local laws... That being said and going against it - you are also able to communicate on GMRS frequencies (the cheap walkie-talkie radios) and there are YouTube videos to show how to do so. It has lots of programmable features that I'll never use." "Great HAM Radio For Yourself or as a Gift. I have been using it every day since I got it. Battery life is long. Functions and features are plentiful for me, a beginning Technician class operator. It was a little tricky learning the programming, but any technician who passed their Ham exam will be able to figure this out. The audio is crisp and clear with more bass and pleasing sounding than the other BaoFeng models, which I own as well. The flashlight is big and bright and the build is sturdy and solid. Performance has been excellent so far as I can tell. I am able to hit our club repeater about 16 miles away using the bigger antenna I bought for it. With the stock antenna, I am able to pick up local simplex traffic from a couple miles out. The manual plus some internet help were the keys for me to learn the programming. This unit feels better in my hand than the other BaoFeng models. I like how it looks as well. More professional. Works great with the accessories and the bigger antenna that I got for it. So far so good. I recommend this radio!" Any of the 3 antennas below are better than the stock antenna. The first is a really good flexible antenna (the 14.5" is better than the 7"). The second two are telescopic antennas. The 660 is probably the best performing antenna you can buy but it is somewhat fragile. The 770 is heavy duty, but still with great performance.